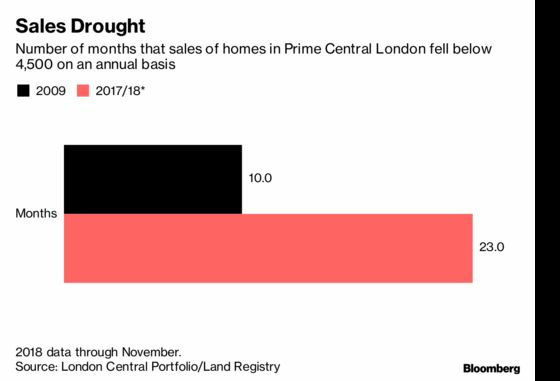 (Bloomberg) -- More evidence is emerging that steep price cuts are hitting home values in London’s best districts as the market struggles to escape the morass that’s engulfed it over the last four years. A real estate fund that owns properties clustered around Hyde Park said this week that a combination of Brexit uncertainty and punitive tax measures caused its net asset value to fall by almost 20 percent in the six months through September. “Prime central London is probably now enduring its most protracted period of price suppression since records began,” a report to investors in the London Central Portfolio Property Fund said, adding that the current slump has lasted more than twice as long as the one during the financial crisis. Purchasers have been put off by a series of levy hikes in recent years. Demand has also dropped following the abolition of tax breaks on landlords’ mortgages and for non-domiciled residents, who are exempt from certain taxes because their permanent home is overseas. Those changes -- together with a prolonged period of political uncertainty including two general elections and the EU referendum result -- mean that a quarter of homes offered for sale in the Kensington & Chelsea and Westminster boroughs have yet to find a buyer after 12 months on the market. The writedown at the fund came after its lender Al Rayan Bank Plc exercised its right to revalue the portfolio, according to a filing. The revaluation of two-thirds of the 43 properties showed a 9.6 percent decline in values on average in the six months through September. Leverage added to the falls. A spokesman for the bank declined to comment. The fund, which holds properties valued at 34.5 million pounds, mainly owns smaller apartments, said Naomi Heaton, chief executive officer of London Central Portfolio, which manages the product. That makes it particularly susceptible to Brexit, because landlords who purchase those properties tend to be more sensitive to political and economic wranglings, she said. While values fell sharply in recent months, the fund’s focus on homes that are typically worth less than 1 million pounds ($1.3 million) meant it had experienced smaller declines in recent years than the wider prime central London market, Heaton said in an interview. More than half the homes listed for sale in Kensington & Chelsea and Westminster -- the districts that make up LCP’s definition of prime central London -- have been on sale for more than six months, according to the earnings report.